This Healthy Blood Orange Curd is ultra creamy, sweet, tart, and delicious. You’d never know it’s sugar free, low carb, low fat, gluten free, dairy free, and vegan! Scoop it over yogurt, layer it in parfaits, spoon some over Vanilla Ice Cream, or dig in straight up with a spoon. Blood Orange Curd and Blood Orange Bars have been on my Recipe Wishlist for years. After finally making Blood Orange Bars the other day, I knew I had to make Blood Orange Curd too. There’s just something magical about blood oranges… I mean, they taste just like regular oranges (maybe a little bit sweeter? ), but the COLOR. Oh my heavenly goodness gracious me, the color! Blood orange juice has this beautiful, vibrant red-meets-fuschia color, and it turns everything you use it in pink. Unlike typical curd recipes that call for 1+ cups of sugar, 8+ egg yolks, and 1½+ sticks of butter (ummmm, no thank you? 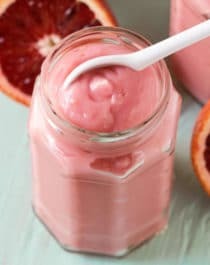 ), this Healthy Blood Orange Curd calls for all-natural, sugar-free erythritol and light coconut milk. Yep, no sugar, eggs, or butter whatsoever! Aaaaand I think it goes without saying that this batch didn’t last a single week in my home. Okay fine, it lasted less than two days……. This Healthy Blood Orange Curd is ultra creamy, sweet, tart, and delicious. You'd never know it's sugar free, low carb, low fat, gluten free, dairy free, and vegan! Scoop it over yogurt, layer it in parfaits, spoon some over Vanilla Ice Cream, or dig in straight up with a spoon. In a double boiler placed over medium heat, whisk together the blood orange juice, zest, and grated beet. In a small bowl, whisk together the erythritol, corn starch, and salt. Whisk the dry ingredients into the blood orange mixture until completely smooth. Then whisk in the coconut milk. Whisk occasionally. When the water in the double boiler starts to boil, whisk the mixture constantly. It should seem like it’s not going anywhere for a while, then it will thicken quite suddenly. When this happens, turn off the heat but keep whisking the mixture over the double boiler for ~1 minute, or until it’s thick like a pudding. Remove the top portion from the double boiler and let cool on the counter for ~1 hour, whisking occasionally. Whisk in the butter flavor, then cover and refrigerate overnight. The next day, give the curd a whisk to make sure it’s even, then spoon into serving jars. Serve and enjoy! This Healthy Blood Orange Curd is purely divine. It’s uber creamy, perfectly sweet, and seriously refreshing. It’s hard to put the spoon down!